Pelvic Rehabilitation Medicine has partnered with Northwell Health in the Research OutSmarts Endometriosis (ROSE) Study to help discover an early detection test for endometriosis. The research and participant selection is being done through the Feinstein Institute for Medical Research at Northwell Health in partnership with the Endometriosis Foundation of America and Pelvic Rehabilitation Medicine. 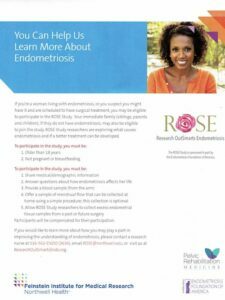 If you would like to learn more about how you may play a part in improving the understanding of endometriosis, please contact a research nurse at 516-562-ENDO (3636), email ROSE@northwell.edu, or visit us at ResearchOutSmartsEndo.org. Download the research participation flyer HERE. Want to Help with the ROSE Study? If you would like to learn more about how you may play a part in improving the understanding of endometriosis, please contact us at: 516-562-ENDO (3636), email ROSE@northwell.edu, or visit us at ResearchOutSmartsEndo.org.